To celebrate our 3rd anniversary, enjoy 30% off all retail purchases (excluding drinks) through the end of April. 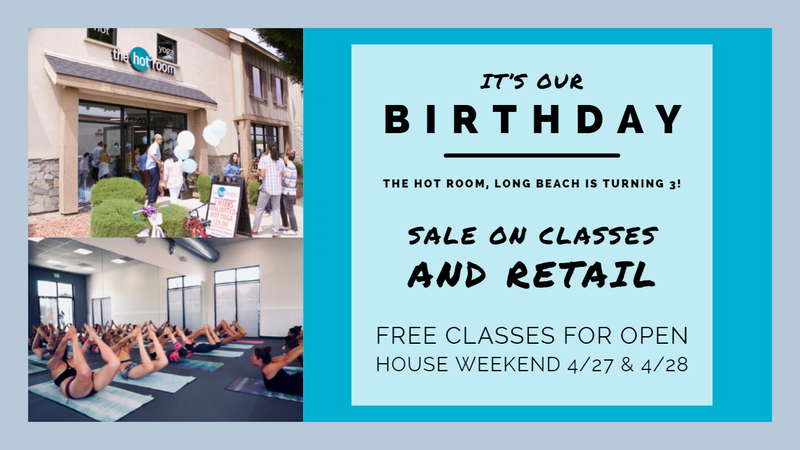 Plus, join us for open house weekend April 27 & 28 for free classes! All open house weekend classes are available for anyone to attend, so reserve your spot early. There is also a FREE FAMILY CLASS on Saturday, April 27 at noon. This class is perfect for those of you with friends, family, or children interested in the Bikram series, but weren’t sure about the heat. The class will be 60 minutes and in a warm room instead of HOT. One set of each posture will be performed so loved ones can get a taste of the beloved yoga that you do! View a Video of Our Awesome Studio! THE HOT ROOM º 4101 Bellflower Blvd, Long Beach, CA 90808 º 562-354-1967 º Nicole@thehotroomlongbeach.com º ©2015 All rights reserved.